Phil dropped out of college at the University of Wisconsin after he realized he could make more money playing poker and moved to Las Vegas. He crushed the local games at school by only playing his "Top 10 Starting Hands." His father, a professor at Wisconsin, was vehemently opposed to his son leaving his academic studies to pursue a career as a professional gambler. He eventually warmed up to the idea after Phil won the World Series of Poker. Phil was once quoted as saying, "If luck wasn't a factor, I'd win every time." That makes him an easy target for critics of his overbearing confidence in his own poker acumen. He often draws criticism for the way he berates players who beat him out of pots. Although his behavior has improved over the years, there are moments when he falls into the role of "Poker Brat." He is very serious when he says that he expects to win every tournament he enters. He has been known to show up late to the first day of the World Series of Poker, in an attempt to gain a psychological edge on his opponents. One of his strengths is being able to read players very well. His reputation and physical presence (he's almost six and a half feet tall) can also be an intimidating factor. If Phil has any weaknesses, it's his overflowing self-confidence and his willingness to get into arguments with other players at the table. If you ask Phil who the best player in the world is, he'll quickly tell you, "Phil Hellmuth." He might be right. After you dismiss all the stories about Phil the Poker Brat, you'll see that his statistics do not lie. He has won tournaments in No Limit, Limit, Omaha Hi/Lo and Seven-card Stud. He has nine World Series of Poker bracelets which ties him for the lead with Doyle Brunson and Johnny Chan. 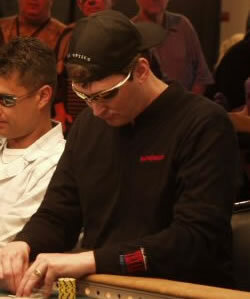 He won his bracelets in various events like Pot Limit, Limit, and No Limit, including three wins in 1993. With $3.5 million in career winnings, he is the second all-time WSoP money winner only behind the 2004 champion Greg Raymer's $5 million. Phil has won tournaments all over the world, including the world's largest Seven-card Stud tournament in Austria and Late Night Poker in England. He also has five World Poker Tour top ten finishes and has made the TV table twice, including the infamous battle at Foxwoods against Hoyt Corkins. Phil is married with two kids and lives in California. He is the author of a few poker books including "Playing Poker Like the Pros," in addition to writing articles for Card Player Magazine. His life story was recently optioned to become a feature film and he's currently working on his autobiography. You can often see him wearing hats and jackets sporting the logo of his online site, Ultimate Bet.